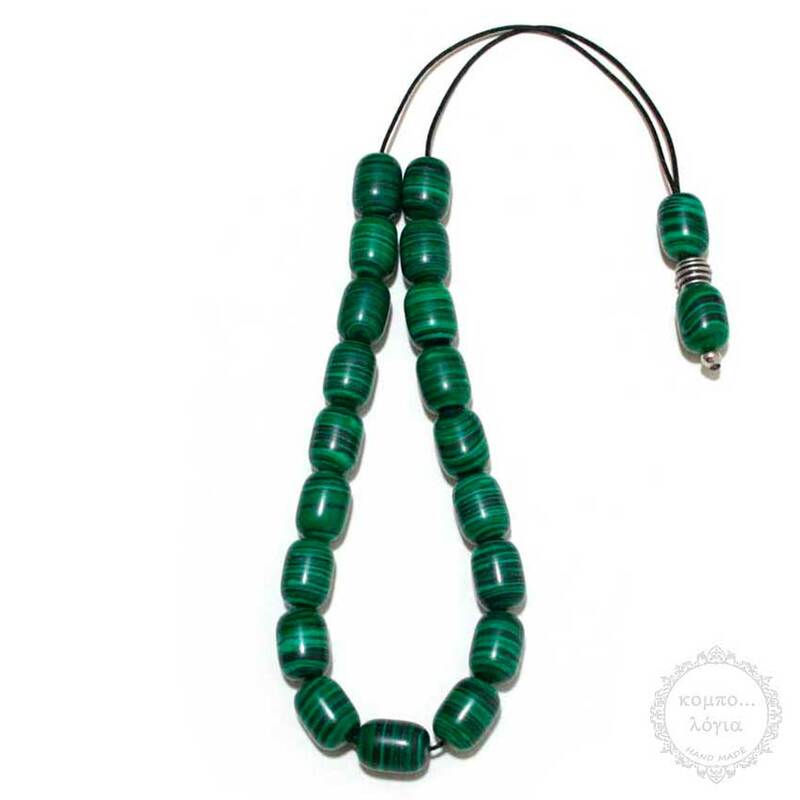 Malachite handmade komboloi created with 19+2 natural Gemstone Malachite beads in barrel shape of 10 x 14mm diameter with original tibetan silver metals, 28cm total length, and 40g total weight. It comes with a free vintage gift pouch. IGS (International Gem Society) Malachite is a beautiful decorative stone. Its rich, patterned coloration in shades of green is unique among gems. Malachite's relative softness makes it easy to work. Despite its low hardness, it also takes a polish very well. These qualities, combined with ready availability, make malachite a popular choice for lapidary artistry. This stone is used extensively to make cabochons, beads, boxes, inlays, and carvings of all kinds. With great care, malachite can also be turned on a lathe to make goblets and candlesticks. Etymology: From the Ancient Greek malache for mallow (an herb plant), in allusion to its color, or malakos, meaning "soft." Occurrence: In the oxidized portions of copper ore bodies, with azurite and cuprite. Nodules, cone shapes, stalactitic, crusts.